Just released: the 2.5 hour special video I mentioned — and only 5 hours left for the Beyond The Phoenix Project special offer! The Beyond The Phoenix Project audio series is finally out on Audible and iTunes! In late 2017, John Willis and I were able to spend a half-day with Dr. Richard Cook and Dr. Sidney Dekker from the Safety Culture movement, and Dr. Steven Spear from the Lean movement. We filmed a session where we explored the potential commonalities and divergences between the two movements. On the one hand, it was amazing to see such an intellectual tour de force of argumentation, spanning philosophy, physics, management and social sciences, medicine, ethics, economics, psychology and even theology. However, at times, it was genuinely nerve-wracking. You can see some of the misunderstandings and disagreements play out — at the halfway point during the lunch break, John and I privately wondered if ending the panel on any sort of positive note was even possible! 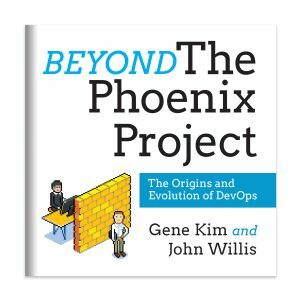 Of course, you know that it ended very well — the 30 minute panel we did afterwards in front of the DevOps Enterprise Summit audience is in Module 7 of Beyond The Phoenix Project, and the video is on YouTube. The video post-production crew scrambled to finish editing over the weekend, and I’m happy to announce that this 2.5 hour panel, modeled after our favorite PBS talk show format, is now posted on YouTube! I’ll admit that it’s not for everyone — but for John and I, it was an opportunity of a lifetime to learn directly from three people who helped define these two fields, and get their advice on how the DevOps community can best achieve its goals. In 2014, I met Sidney Dekker at DevOpsDays Brisbane. After his presentation, I approached him about the notions of complexity and non determinism as a possible narratives to his safety, human factors and resilience ideas. He agreed to look into some of Dr. Deming’s work and over the years we have been able to explore some of the similarities between Deming and Safety Culture. A year later, in 2015, I had the opportunity to read Mike Rother’s Toyota Kata and loved how he described an improvement model based on uncertainty and non determinism based on what Toyota was doing starting around 1950 to 2000. More commonly referred to as Lean. Later that same year I ran into Dr. Woods and Dr. Cook at an O’Reilly conference in NYC and I tried to bring up the idea that Safety and Lean might have some interesting common patterns. In all honesty there seemed to be a little resistance to my hypothesis. Over the next few years I started working with Gene (Gene Kim) about trying to get these two groups (Safety and Lean) to explore the common patterns to help create some global learning opportunities. At DevOps Enterprise Summit in November 2017 we were able to get Dr. Dekker, Dr. Spear and Dr. Cook together for almost 3 hours. Summarized down to 2.5 hours, we were able to explore some of the perceived harsh difference at first. However, later in the conversation we found a lot of common ground. For me it was a highlight of my career to be a small part of this amazing event. You can view the full 2.5 hour panel video here! And just a reminder: there are only five hours left in the special offer that John and I are doing – you’ll get instructions to join a private AMA (Ask Me Anything) session that John and I will be hosting, and you will also receive the written transcript for the entire series— this includes citations and links to all the mentioned books, videos and blogs. To participate in this offer, send in your purchase receipt for Beyond The Phoenix Project from Audible or iTunes to offers@itrevolution.net with the subject line “AMA”. The deadline for this offer is Monday, March 12, 2018 at 5pm Pacific. Thank you so much for all of your support, and please let us know what you think of Beyond The Phoenix Project — we hope you have as much fun listening to it as we had producing it! 1) Email your proof of purchase to offers@itrevolution.net with “AMA” in the subject line. 2) We will send you a PDF of the transcript within two to three business days. 3) You will receive a second email within a week containing complete details on the AMA. Our plan is to host the event in April.